Free music teaching resources. 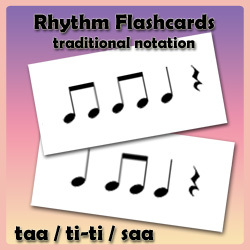 This set of rhythm flashcards contains rhythms using quarter notes, eighth notes and quarter note rests in a PDF file. A helpful aid in teaching rhythm to children, this set contains 18 printable flashcards. Free music teaching resources. This set of rhythm flashcards contains rhythms using quarter notes, eighth notes and quarter note rests in a PDF file. A helpful aid in teaching rhythm to children. One set of eighteen printable flashcards in traditional notation.